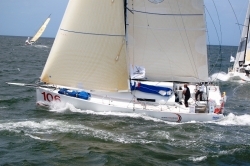 At 12:00 UTC on Sunday, American solo sailor, Joe Harris, crossed the start line of the 1,000 mile, Normandy Channel Race on his new Akilaria RC2 Class40, GryphonSolo2, racing in this demanding double-handed event with Global Ocean Race 2011-12 (GOR) Race Director, Josh Hall. While the duo are fully-focused on the current race, shortly before the start gun fired off the town of Ouistreham, Harris announced that he has entered GryphonSolo2 in the single-handed version of Hall's Class40 round-the-world race, the Global Solo Race 2013-14 (GSR). For Harris, a highly-experienced solo sailor, former commercial fisherman and boat builder who is currently running his own real estate investment, development and consulting firm, entering the GSR is the first step in fulfilling a longstanding goal: "For me, this will be the culmination of a dream I have had for a long time and I am very pleased to be the first entrant to the Global Solo Race 2013-14," he confirms. Harris and Hall have collaborated on numerous racing campaigns, winning the 50ft monohull class together in the double-handed, 2005 Transat Jacques Vabre on the American skipper's Finot Design Open 50, Gryphon Solo, and the GSR entry continues this successful relationship. "I am sure that many entries will follow mine," Harris predicts, "but it somehow feels appropriate that I enter this race first, as this was really my dream when Josh and I sailed together in the 2005 Transat Jacques Vabre and came up with the idea of the GOR," he explains. "Many days of hard work by Josh and his team have gone into creating the fantastic race that the GOR has become, as is witnessed by the 19 entries in the 2011-12 edition set to start in September." The GOR's format has particular appeal for Harris: "The race concept combined with the popularity of Class40 has really hit the mark," he adds. "I see a very bright future for both the GOR and GSR. In early March, GryphonSolo2 was shipped from the MC-TEC yard in Tunisia to La Trinité-sur-Mer, Brittany, for commissioning before sailing to Caen and final pre-Normandy Channel Race preparation. Harris has always been meticulous in race planning and the programme for the build-up to the GSR is meticulous: "I feel it will be best to work the boat and myself into prime competitive shape over the next two years," he confirms. "So, when I hit the start line in 2013, every piece of equipment on the boat will be tested over many miles and all the bugs of a new boat will be worked out. I also need to get back into 'offshore condition' after a bit of a break following the sale of my Open 50," Harris concedes. "The Normandy Channel Race will be the first step in that process." In addition to his victory in the Transat Jacques Vabre, Harris has campaigned heavily in the shorthanded offshore arena completing eight Newport-Bermuda races; four Marblehead-Halifax races; four Bermuda One-Two races - an event in which Harris holds the single-handed record - and the single-handed, Plymouth-Boston Transat Race in 2005 taking second place in the Open 50 class. Joe works hard at balancing his family life and business enterprises and his passion for sailing: "I need to express deep appreciation to my wife Kim and kids Griffin (13), Emmett (7) and Sophie Grace (4), for their support in this somewhat unusual endeavor," says Harris. "Normal day-to-day family life does not generally contemplate a single-handed around the world sailing race," he admits. "However, if I can send one message to my kids, it would be 'follow your passion' as I think the convergence of competence and desire is the magic elixir of success. Hopefully my absence while at sea will be compensated for by inspiration." Normandy Channel Race co-skipper and Race Director of the GOR and Global Solo Race, Josh Hall, is delighted that Harris has entered the GSR: "It would be an understatement to say how pleased I am to have Joe as the first entry in the GSR 2013-14," says Hall. "A great friend and sailing partner, we have raced many miles together double-handed and this is a huge step towards Joe realizing his life-long ambition of racing solo around the planet," he continues. "Joe's stars are coming into line and he is going to be a hugely competitive and popular skipper in the GSR with a very fast and reliable boat under his seaboots." As soon as GryphonSolo2 crosses the Normandy Channel Race finish line, Harris, Hall and their support team, which includes 2008-09 GOR veteran, David Thomson, plan to remove the yacht's carbon rig and prepare the Class40 for the GOR and GSR's mandatory 180 degree self-righting test scheduled for Monday 30th May at the V1D2 specialist offshore racing yard in Caen. Photo courtesy of the Global Ocean Race.